Although originally discovered in 1964, this crafty little fella' has been making headlines all week! Amphioctopus marginatus, commonly known as Veined Octopus or Coconut Octopus, dwells in the tropical waters of the western Pacific Ocean. The Coconut Octopus is named so for a very peculiar behavior: it carries coconut shells and clam shells across the ocean floor and uses them to build fortresses. it is the only invertebrate known to use tools, and one of only two octopuses known to exhibit bipedal behavior by "walking" on two of it's legs. The Coconut Octopus's diet consists of shrimp, crabs, and clams. The body of the Coconut Octopus is typically around 8 centimeters (3 in) in size, and, with arms, approximately 15 centimeters (6 in) long. 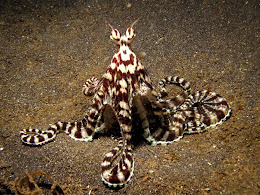 The octopus displays a typical color pattern with dark ramified lines similar to veins, usually with a yellow siphon. The arms are usually dark in color, with contrasting white suckers. In many color displays, a lighter trapezoidal area can be seen immediately below the eye. Although octopuses often use foreign objects as shelter, the sophisticatedbehavior of Coconut Octopus when they select materials, carry and reassemble them, is far more complex. 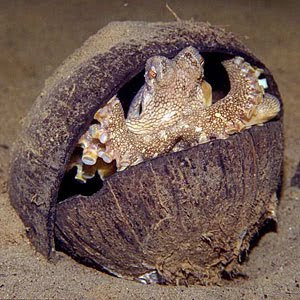 Coconut Octopus's use of coconuts shells and clam shells hasfascinated scientists, mainly because this is the first invertebrate known to carry and maintain objects for future use. 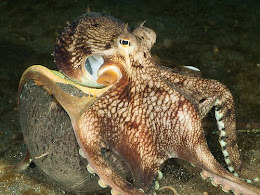 Interestingly, while the octopuses are transporting the shells, they receive no protection from them. This is highly unusual behavior. One Everything Octopus reader even contributed his take on the Coconut Octopus, which you can read HERE. 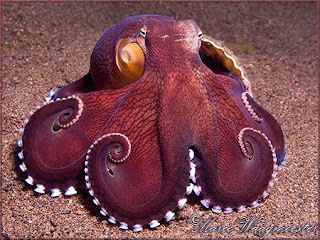 Stay tuned to Everything Octopus for more about the Coconut Octopus! 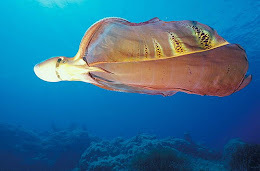 I hear about this behavior in Viagra Online, according with the research octopus make this when it is certain age stage, or well also as a good trap to catch it prey.